I am so pleased to see Daniella stepping up and taking charge so that ‘Teens Against Cervical Cancer Fund’ can continue to support young girls in Tijuana. Why: Proceeds of the fashion show will benefit the “Teens Against Cervical Cancer Fund” at the International Community Foundation which is supporting HPV vaccines provided by Fronteras Unidas Pro Salud free of charge to low income girls living in Eastern Tijuana. Cervical Cancer is now the second most common cancer in Mexico, killing over 5,000 women in the country last year. 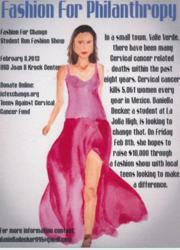 In an effort to stop the spread of this otherwise preventable disease, a La Jolla, California-area teen, Daniella Decker, is organizing a student-run fashion show dubbed “Fashion for Philanthropy” with the goal of raising $18,000 to assist young girls in Tijuana to obtain the HPV vaccine in cooperation with Fronteras Unidas Pro Salud. The “Fashion for Philanthropy” fashion show and reception is scheduled for February 8th, 2013, at the University of San Diego, Joan Kroc Center for Peace & Justice. It will feature over 64 teenage male and female models from La Jolla-area high schools. Daniella, a junior attending La Jolla High School, came up with the idea of the fashion show after hearing a talk this past spring by Caitlin Hird, a youth volunteer with the International Community Foundation, founder of the “Teens Against Cervical Cancer Fund,” and who has raised over $19,000 to help over 110 girls receive the HPV vaccine. As Caitlin departed for college, she successfully passed the baton to another passionate youth philanthropist who is continuing the cause and keeping the work of the “Teens Against Cervical Cancer Fund” alive.